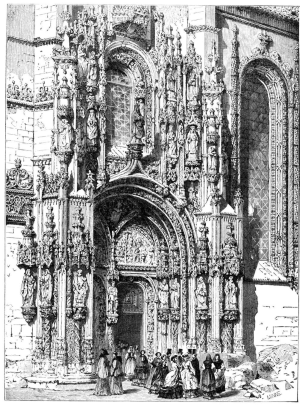 "As the sun set behind the mountains, the signal towers shifted to night operation. One by one, the beacons flared and the messages were passed on. Rivers of light were racing through the night…"
This realm is unique in the known lands in that it has a single "official" religion - that of the god Thenos, whom the inhabitants revere as the creator of the universe and the provider of their daily needs. The Patriarch of the religion rules from the capital of Thenares, and the whole church hierarchy is dedicated to the twin duties of preaching to the flock and administering the realm. Outsiders and their religions are grudgingly tolerated within Thenares as long as they don't preach or try to convert others to their faith. Still, pogroms within certain towns and cities against members of minority religions happen from time to time, although the church tries to prevent these in most cases. 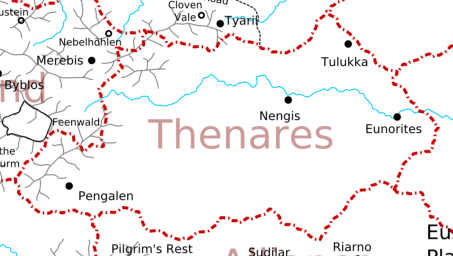 Traditionally, Thenares has been a primarily agricultural land, and any new arrival who followed Thenos (or at least could pretend to do so convincingly) received a plot of land and did not have to pay any tithes or taxes for ten years. By now, Thenares has largely run out of new arable land to distribute, but the exemption from taxes and tithes remains in force, and some rich merchants and industrialists relocate here to dodge taxes in their native lands. As they bring further wealth to the land, they usually find a welcoming reception. After the fall of the Atalan Empire, the region now occupied by Thenares was filled with numerous small independent fiefdoms constantly squabbling with each other. This diversity was also reflected in its diversities of faiths which had long been established in the region, but over time the number of followers of Thenos increased in number, thanks to both missionary work and refugees from elsewhere. Initially they were tolerated, but as their numbers grew the leaders of the other religions - and the worldly leader who listened to them - began to see them as a threat. This culminated in a series of pogroms against the followers of Thenos. Finally, in 1025 NA Gerbold, a merchant of Sabres, who would later become known as St. Gerbold the Unifier, found his family dead from such a pogrom after returning from a trading venture and called for the people of his faith to strike back. Thanks to his charisma he quickly gathered a large number of followers, first striking back at those who had hurt his faith the most and then conquering or allying with city after city. Many rulers converted to the faith of Thenos out of their own will (either because of Gerbold's oratory, or because they saw where the wind was blowing), while others resisted and were defeated. Initially Gerbold was magnamious in victory to those who surrendered, but as the war dragged on he began to order mass executions of those who held out to the bitter end and who preferred to die rather than convert. In the end, Gerbold had managed to conquer a large realm when he died in 1071 NA, and before he was called back to Thenos he named the realm Thenares, the new home and center of the faith. His successors at times attempted to further expand Thenares via conquest. The most successful of these was the crusade in 1104 NA against the holdover heathens to the south (many of whom had fled from the region of Thenares during Gerbold's campaigns), and the latest was the occupation of Tulukka in 1393 NA during a civil war in the neighboring Hobgoblin Dominions. Still, there is a growing unease about using force to convert others to Thenos among the priesthood, and while the realm maintains military readiness, it gradually shifts towards missionary work instead of swords as a way of spreading the Good Word of Thenos. Despite the usual temptation, I want to avoid making this theocracy to be full of bigoted, holier-than-you bullies and jerks. Yes, most people here are sure in their faith, but there are at least as many good and caring people as there are bigots.